Collective nouns are used for groups of people, animals, plants, or things. While in some languages collective nouns are easy to use because they always require a singular verb, in English, it is not so. 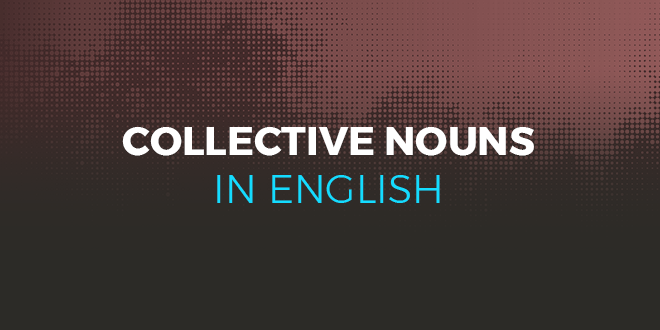 Check out collective nouns in English with @ABAEnglish. If in American English the verb is in singular, in British English, these nouns may require the verb in both singular and plural. Let’s look at the rules that must be considered so as not to make mistakes. We must pay close attention to the verb. Even English speakers learn to conjugate the verb correctly only through time and with a lot of practice. For us, foreign language speakers then, errors could be made due to differences with our native tongue. Here we will present the general rules. If the collective noun is used in reference to the group as an entity, then the verb is conjugated in the singular, for example, a group of musicians who play the same instrument in unison or a group of students in a class that is performing the same task. The class started their exam at 10 am. If, on the other hand, we refer to the group wanting to highlight the composition of the individuals that act differently, then the plural verb is required. In the following example, each student chooses a different book and works individually. The class were reading books in the library with their teacher. The collective nouns cattle, police, people, and youth always require the plural verb. The police were very effective. The collective nouns of countless sets – such as accommodation, advice, hair, information, luggage/baggage, macaroni, rubbish – use the verb in singular, for obvious reasons. Some collective nouns are accompanied by the preposition ‘of’ and the noun for the people, animals, plants, and things which they name. The peculiarity of the English language lies, however, in the variety of these nouns and also, sometimes, in their extravagance. Some nouns can be used to name groups of people, as well as animals, plants, or things. There are some collective nouns that, as we have mentioned, are really particular and imaginative. In the case of English, this is for two main reasons: on the one hand, the influence of French, which has inspired many English nobles to coin some evocative terms; on the other, the desire to refer to the outstanding qualities of the group, such as behaviour or appearance. The result has been, in some cases, really effective. Let’s look at some of the collective nouns that deserve a special mention. Try to find the reason behind the minting of these expressions. These are just some examples of the many collective nouns in English. If you love English, why don’t you try our online course? ABA English offers 144 grammar video classes and an equal number of short films to learn English using an intuitive method. What are you waiting for? Try one of our video classes today! OK, I want to see a video class!